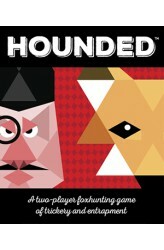 In Hounded, players will either be the cunning fox, trying to elude capture, or the determined hunter, trying to hunt down the fox. In the game. each player moves their pawns and turns over tiles as they do, sometimes triggering effects and sometimes not. While the fox character is alone, the hunter has a team of hounds to help him hunt the fox. All the hunter has to do to win is either corner the fox with his dogs or force the fox to end his turn next to the hunter himself. For the fox to win, it has to run out the clock, which is done by either finding the three timepiece tiles or flipping over 43 of the 49 tiles. Once time runs out, the hunter has to retire for the day and the fox escapes! https://www.youtube.com/watch?v=77VS3OfN-B4 ..
Once Upon A Time is a game in which the players create a story together, using cards that show typical elements from fairy tales. One player is the Storyteller and creates a story using the ingredients on her cards. She tries to guide the plot towards her own ending. The other players try to use cards to interrupt her and become the new Storyteller. The winner is the first player to play out all her cards and end with her Happy Ever After card. The second edition, published in 1995, features an expanded card set. 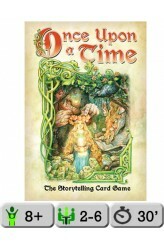 The third edition, published in 2012, features multiple changes, including new artwork by Omar Rayyan, a new card set, and a simplified rulesheet. https://www.youtube.com/watch?v=9_LSGuokiZc ..